Robert Parker ha estado en España el día 4 de Mayo. El motivo, una condecoración por Mérito Civil otorgada por la Ministra de Medio Ambiente y Medio Rural y Marino. 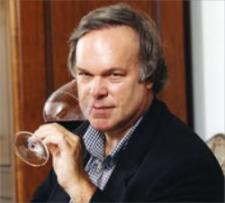 El Observatorio Español del mercado del vino (oemv) ha tenido la habilidad de incluir una mesa redonda con la presencia de Robert Parker en unas jornadas dedicadas a turismo de vino. Parker ha hablado de forma clara sobre los vinos españoles, mostrando que tiene una muy buena opinión de los mismos, y una visión optimista respecto a su futuro, pero para ello sugiere trabajar en 3 áreas de actuación: Educación, promoción y social media. Os mostramos algunas de las frases más interesantes que hemos recogido (las ponemos en inglés para que el mensaje no pierda en la traducción). Como vereis algunos comentarios no tienen desperdicio y dan para pensar. "French are masters in creating an image of deluxe"
"I´ve never served a Spanish wine people would not like"
" Tweeter is like a good virus and wineries need to tweet"
" The entire life of young people is on their smart phone"
" The big awareness of Spanish cuisine should be done together with promotion of Spanish wines, and I don´t think this is being done in all cases"
"There is a vacum being created, people may not want to continue paying astronomic amounts for some wines. This can be a good opportunity for Spanish wines"
" We Americans buy what is good, and we don´t have prejudices about new things"
"Wine has become the number 1 beverage of choice in the EEUU"
" I am very optimistic about Spain"
" You should have a site in Mandarin. It is a sign that you want to be someone in that market"
"More agressiveness is needed in tastings to educate the market"
" Some american that start in wine may want a bit of sugar in the wine, but not to know that this is the case"
" Americans love fruit in wine"
" The information in the back label is very important, specially when women are buying, because they make intelligent buying decisions"
" Fino and Sushi work very well toegher. The challenge might be to convince Japanese Chefs that this is better than shake"